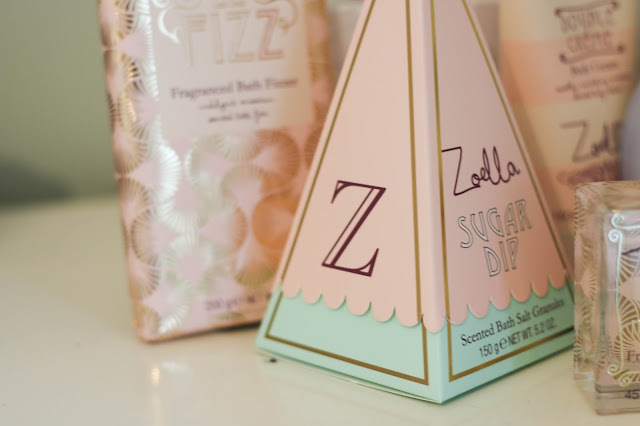 Yes, I've jumped on the bandwagon, with a post on the new Zoella beauty range, however with such adorable packaging why wouldn't you want to have photographs of it all over your blog, especially when there are people wanting to hear what others have to say about these products before purchasing, and for those who haven't been able to resist buying from the latest Zoella Beauty range, it's always interesting to see if others share the same opinion as you. Like most things which pass off our lips, there's is a reason people are talking about it, so I thought I'd have my say. I kind of have mixed feelings about the collection. 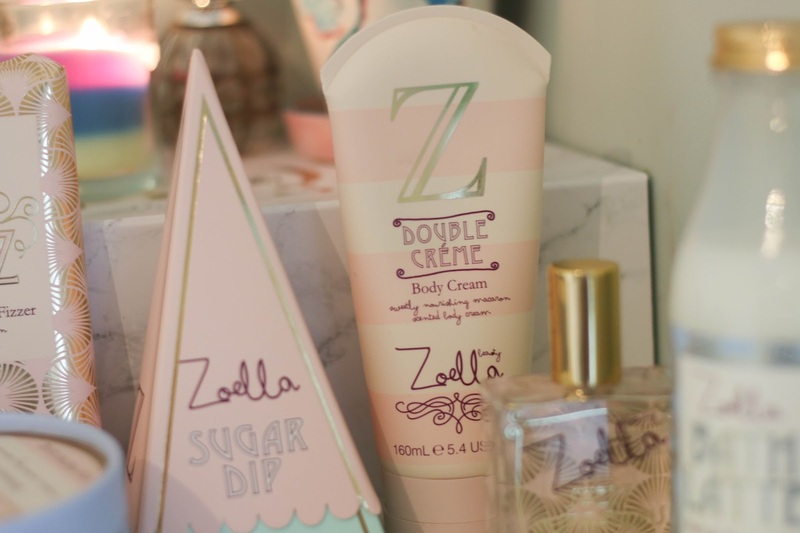 As I have touched on, the packaging is very pretty, and I think really echo's Zoe and the Zoella brand beautifully. The scent I also love. It's very sweet, but not sickly. 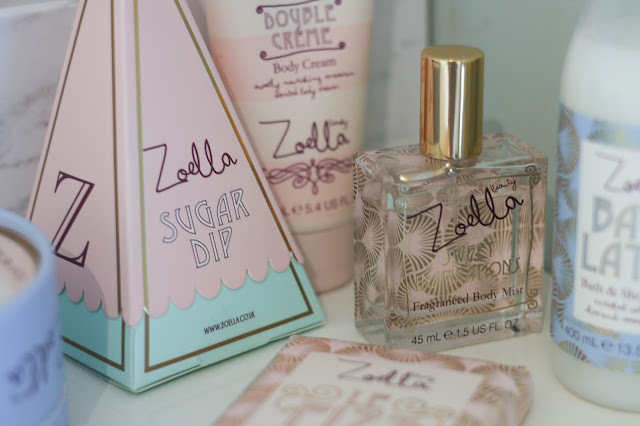 I went into Superdrug and spritzed the fragrance to see what I thought, having smelt the fragrance I decided it was a winner and picked up a few bits; the Bath Latte, Body Cream, and Body Fondant. Throughout the rest of that day I found myself catching a whiff on the Body Mist, every now and then and falling more in love with the fragrance, so a few days later I returned to Superdrug and bought the rest of the range (besides the makeup bags, I have far too many of those already). As you can tell my very first impression of the range was pretty good. Now I've covered the aesthetics and the scent, let's get to the actual products. I have found myself enjoying the Double Cream, the most. I have been looking forward to putting on my body moisturiser, which is a task I often find annoying and skip quite a lot. However, as I love this scent, and the thickness of this cream I am enjoying this step a lot more. This is definitely a product I'm going to repurchase. I like the scent, the formula, how it leaves my body feeling, the packaging, and the price. It's an all round win-win situation with this one. 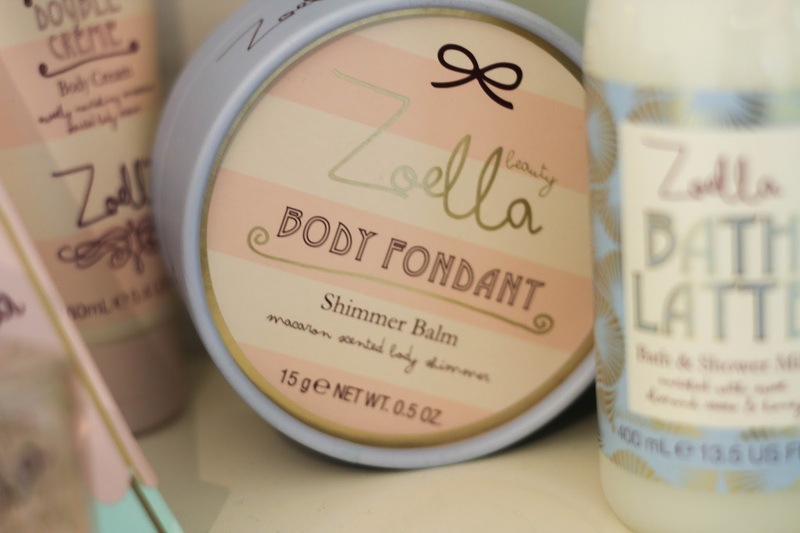 An another slightly more unexpected loved from the range is the Body Fondant. I bought this purely out of curiosity as I'd never really tried a product like this before, and t I didn't really have high expectations, However, I was pleasantly surprised. The body fondant looks quite dark in the packaging. I opened it up and thought 'oh dear lord this is going to look ridiculous on my pale skin', which I was very wrong about. On the skin it offers a subtle iridescent shimmer and a small hint of warmth, yet has no effect on the colour of your skin. 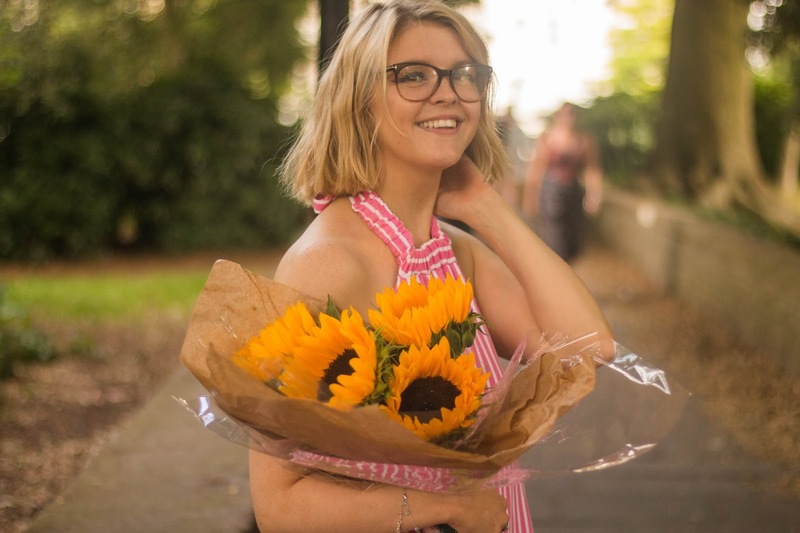 The best way I can think to describe this is a body highlighter which adds a subtle, healthy and pretty glow to your skin - which is perfect for me because I don't fake tan, but sometimes I do think it would be nice to give a little something extra to my skin. I like the balm formula to this also, it's not too heavy, or drying either. 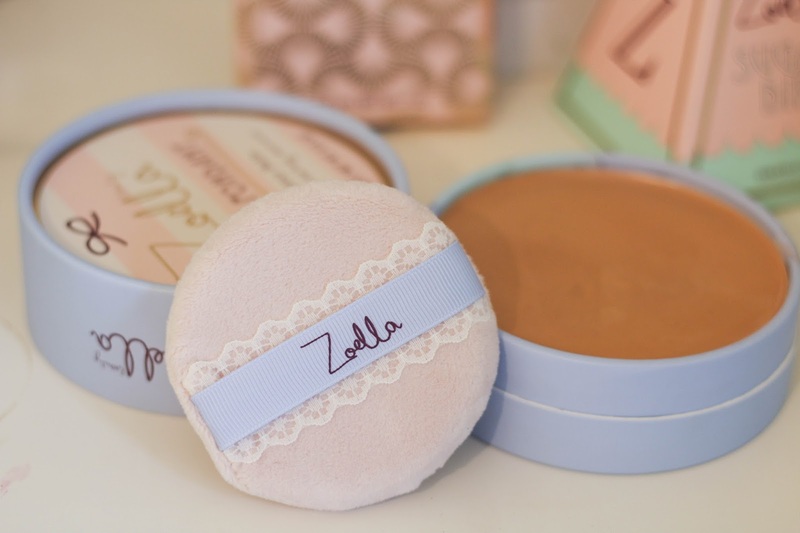 The body fondant also comes with a cute little puff for the application which is soft and makes for a quick and even finish. I do find a packaging of this one a bit odd. 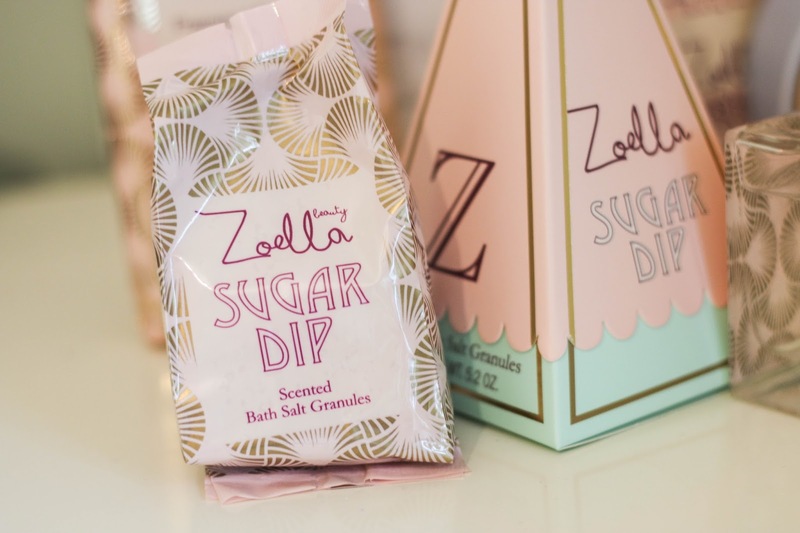 It's cute I know that, but the Zoella logo on the side of the lid is facing downwards, so they writing on the side looks upside down - or with the writing the correct way you have the ingredients and the boring bits at the top of the packaging, has anyone else noticed this? It's confused me slightly (I have just looked it up - it appears mine is the only one like this, what? Someone messed that packaging up). From this range I was most excited for the bath products, I love a good bath (who doesn't? 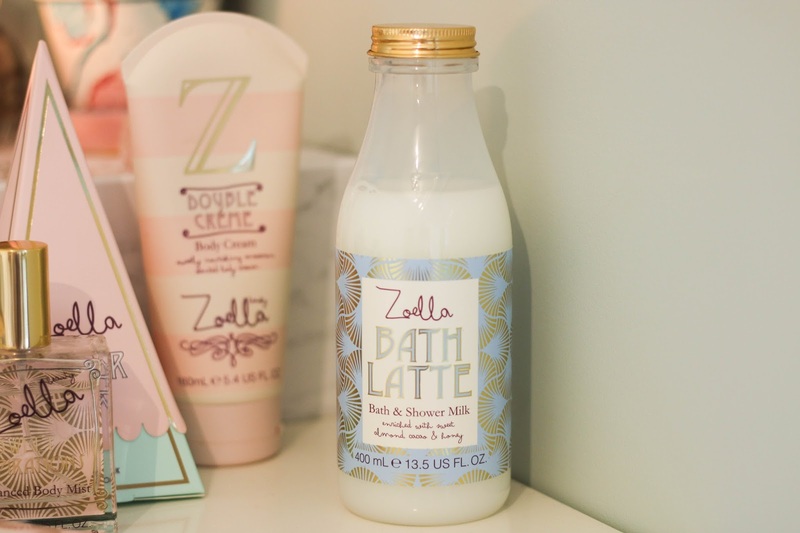 ), so I was most excited when I saw Zoe was releasing her 'Bath Latte'. Straight after I purchased this I ran myself a bath and poured some in. 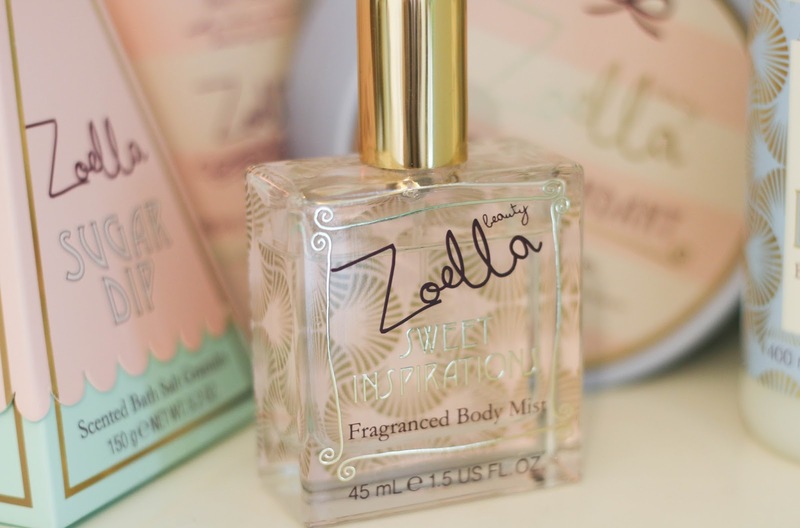 I like the actual product, it smells great and produced lovely bubbles but I have been getting through it quite quickly. I have found you need to use quite a lot to create the super bubbly bath which I'd expected from a less of the product and the bubbles don't last as long as I would like, however, they may be partly because I tend to have the longest baths ever. 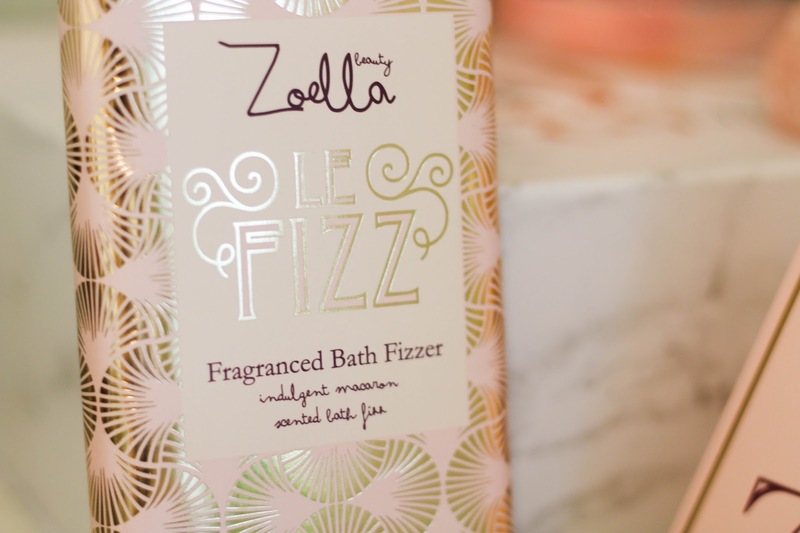 I do really like the product, and for the price it's great, but I don't think it's any more special than any other bubble bath I've previously used. Also, the bottle is very sweet, but it would be so much more sophisticated (can packaging even be sophisticated?) if it were glass. However, you get what you pay for. I felt somewhat disappointed with the Bath Salts. You get a lot of them considering the price, but I had a bit of a fail with opening them, as I pulled the plastic packaging apart, it did not come open as I expected, instead it ripped across the centre of the bag and bath salts went everywhere, which really was not ideal! However that could just be how I opened the packet rather than because of the actual packaging, and the outer box made this less of an issue as I could pop them back into the box with less worry about them spilling out of the broken bag. Again, I found I needed quite a lot of these bath salts to make a difference to my bath, which isn't necessarily a problem as there was so many in the packet. The bath salt infused my bath with that splendid sweet smell - however, they don't achieve much more than a faint pretty scent. The bath fizz bar I found to have quite a similar effect to the bath salts it added a light scent to my bath, but not really doing a lot more than that, although it is quite satisfying to watch it fizz away in your bath. I also love the bar concept to this, it's a great way to allow you to easily break off the amount you want. I've found myself adding a line of this to each bath which is three squares, but if that's not enough for you can always add more. 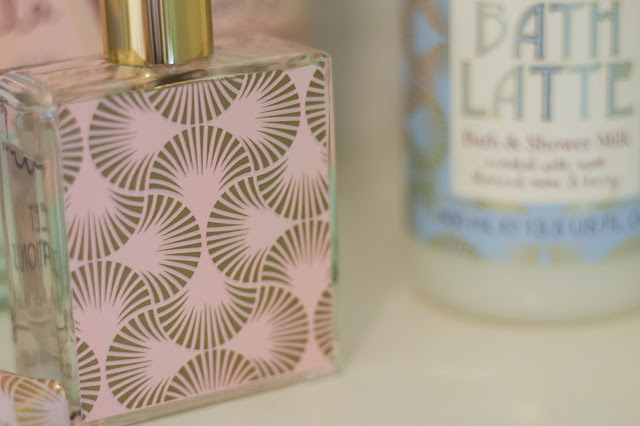 Lastly, the Body Mist, the product which attracted me to the rest of the range. Firstly I'll say this product feels a lot more pricey and therefore feels a lot more luxurious than you'd expect with it £8 price tag. The scent I find it longer lasting and higher quality than I'd expect for a body mist so I've been using it as though it's perfume rather than a mist. I find this is a great scent to wear to work, because it smells lovely, and when used just on the neck, wrists etc as you would a perfume it is fairly subtle, yet very pretty and. of course it's such a good price you don't have to worry about using up your expensive fragrances on a daily basis, but still smell great. I'm sorry for the length of this post, apparently, I had a lot more to say on the range than I'd realised. 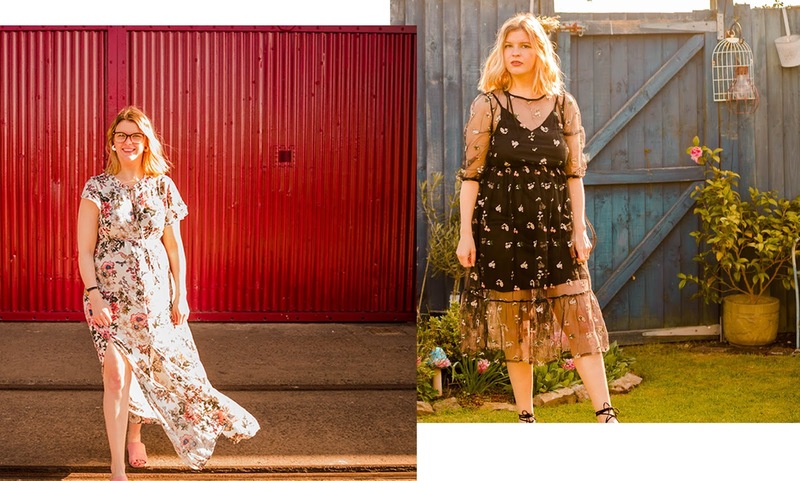 I'd love to hear your thoughts if you've tried any of these bits out.